Background : Chemical peeling entails application of chemical agents to the skin causing a controlled chemical burn, thereby achieving improved texture and quality of skin. Aim: To evaluate the efficacy of glycolic acid in melasma and other causes of hyperpigmentation. Materials and Methods: A total of 20 patients were included in the study. After adequate priming, application of glycolic acid in various concentrations in biweekly interval for a period of 16 weeks was done. Post-treatment photographs were taken and were subjected to analysis. Results: Melasma constituted 11 patients and hyperpigmentation, ie, post acne marks and freckles due to sun exposure accounted nine patients. Complete resolution of melasma was possible only in one (9%) patient and good improvement in four (36.3%), whereas five (45.5%) patients showed fair improvement. In cases of hyperpigmentation, three (33%) patients showed excellent improvement, one (11%) showed good improvement, and five (55.5%) patients showed fair improvement. The patients of melasma took an average of 7.33 number of peels to show improvement and those of hyperpigmentation took 4.2 peels. Conclusions: Melasma shows fair to good improvement and requires more number of peels as compared to other causes of hyperpigmentation in skin. Postinflammatory pigmentation shows excellent improvement in the majority of patients. A total of 20 patients attending our outpatient department in Dr. D. Y. Patil Hospital and Research Hospital, Pune, with melasma and post-inflammatory hyperpigmentation were included in our study. Patients' clinical details and the nature and severity of lesions were noted. Clinical photographs were taken at week 0 (baseline) and week 16 (completion of study). Following an informed consent for the procedure and clinical photographs, a test peel was done and all patients were primed with tretinoin cream (0.025%) and a broad-spectrum sunscreen for a total of two weeks. Serial glycolic acid (GA) peels were then undertaken at fortnightly intervals. 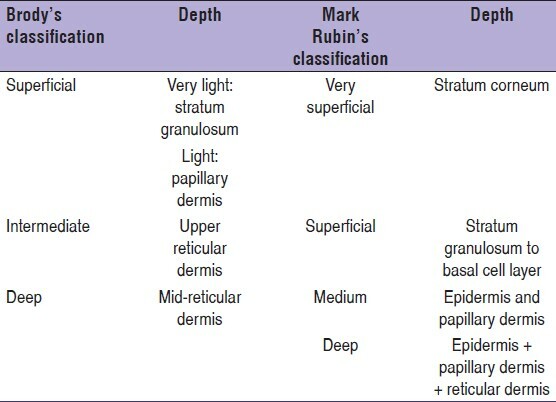 Superficial chemical peels (up to the level of stratum granulosum) were attempted according to Brody's and Mark Rubin's classification. We started with 35% GA for a period of 1-2 minutes, serially increasing the duration and concentration of 50% GA for five minutes was used. All patients were advised total sun protection with a broad-spectrum sunscreen. Side effects, if any, were also recorded. At 16 weeks, the patients were evaluated and the response to therapy was graded on a five-point scale as excellent (>80% improvement), good (50-80%), fair (<50%), and no change or worse. The final assessment was recorded on the basis of the opinion of the clinician, perception of the patient, and photographic analysis. Among 20 patients included in the study, 16 were female and 4 male. The patients were in the age group of 16-56 years. Melasma constituted 11 patients and hyperpigmentation, ie, post acne marks and freckles due to sun exposure, accounted nine patients. 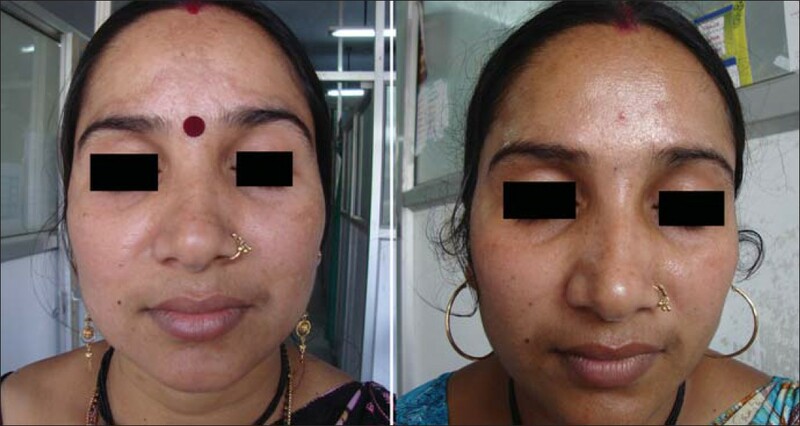 Complete resolution of melasma was possible only in one patient (9%) [Figure 1]a and b and good improvement in four (36.3%), while five (45.5%) patients showed fair improvement. In cases of hyperpigmentation, three (33%) patients [Figure 2]a and b showed excellent improvement, one (11%) showed good improvement, and five (55.5%) patients showed fair improvement [Table 2]. The patients with melasma took an average of 7.33 number of peels to show improvement and those with hyperpigmentation took 4.2 number of peels [Table 3]. No side effects were encountered. Better skin texture and smoothness was found in all patients who underwent peeling. Melasma is a common disorder characterised by symmetric, hyperpigmented patches with an irregular outline that occur most commonly on the face. Exacerbating factors include pregnancy, oral contraceptives, and sun exposure. Freckles are hyperpigmented macules occurring on face mainly due to sun exposure in fair-skinned individuals. Acne vulgaris on resolution can leave hyperpigmented spots, especially in dark-skinned individuals, they may be aggravated due to sun exposure. Pigmentation on face is of great concern cosmetically; hence, large numbers of affected individuals seek treatment for it. In our study on patients of melasma, a majority of patients (81.82%) had good to fair improvement, which is in agreement with the finding by Lim et al. and Grover et al. in their study of melasma. , Burns et al. and Grover et al. reported a more rapid and better improvement in postinflammatory hyperpigmentation with the use of GA peels. This was reflected in our study as well, as melasma improved with an average 7.33 number of peels as compared to an average of 4.2 peels in cases of other hyperpigmentation disorders. In our small, non-blinded study, we conclude that chemical peeling with GA gives better and faster results with post-acne hyperpigmentation and freckles as compared to melasma. Moreover, we report this study to create awareness among physicians of all disciplines that chemical peeling is a simple, office-based procedure for effectively addressing common hyperpigmentation disorders of skin. 1. Ting W. Tretinoin for the treatment of photodamaged skin. Cutis 2010;86:47-52. 2. Savant SS. Superficial and medium depth chemical peeling. In: Text book of dermatosurgery and cosmetology. In: Savant SS, editor. 2 nd ed. ASCAD, Pune; 2005. p. 177-95. 3. Khunger N. Standard guidelines of care for chemical peels. Indian J Dermatol Venereol Leprol 2008;74:5-12. 4. Grover C, Reddu BS. The therapeutic value of glycolic acid peels in dermatology. Indian J Dermatol Venereol Leprol 2003;69:148- 50. 5. Chang MW. Disorders of hyperpigmentation. In: Bolognia JL, Rapini RP, editors. Dermatology, 2 nd ed. Spain: Mosby Elsevier Publishers; 2008. p. 939-64. 6. Barnhill R, Rabinovitz H. Benign melanocytic neoplasms. In: Bolognia JL, Rapini RP, Jorizzo JL, editors. Dermatology, 2 nd ed. Spain: Mosby Elsevier Publishers; 2008. p. 1757-58. 7. Burns RL, Prevost- Blank PL, Lawry MA, Lawry TB, Faria DT, Fivenson DP. Glycolic acid for postinflammatory hyperpigmentation in black patients. Dermotol Surg 1997;23:171- 5. 8. Lim JT, Tham SN. Glycolic acid peels in the treatment of melasma among Asian women. Dermatol Surg 1997;23:177-9.